Managing broiler and turkey litter—a mixture of poultry manure and bedding—is a major responsibility for poultry producers. In some cases, these by-products can be handled by the producer directly on the farm or on nearby cropland. However, in many situations, management options other than land application on the farm are needed. Poultry producers often rely on commercial cleanout contractors to periodically remove poultry litter from houses. Both the producers and the cleanout contractors must be aware of state rules and regulations governing the removal and land application of the litter. Litter is a valuable resource because it can be used as fertilizer and source of organic matter. However, improper handling can allow excess nutrients to pollute surface water or groundwater and may cause public nuisances. Figure 1. New state rules govern how poultry producers and commercial contractors can apply poultry little on North Carolina farms and other land. Poultry litter is commonly applied to cropland near the farm that generates the litter because of transportation cost. The litter provides plant nutrients, typically at agronomic nitrogen rates. An agronomic nitrogen rate is the amount of nitrogen a crop needs to achieve a realistic yield. The actual nitrogen requirement is a function of two factors: crop yield (usually expressed as units of yield per acre) and the nitrogen application factor (usually expressed as pounds of nitrogen per unit of yield). Multiplying these two factors produces a realistic nitrogen rate (usually expressed as pounds of nitrogen per acre). Examples of realistic yields, nitrogen application factors, and realistic nitrogen rates can be reviewed on the website Realistic Yield Expectations for North Carolina Soils (Crouse, 2010). In some cases, such as when the concentration of soil phosphorus is high, the litter will be applied at a rate much lower than the agronomic nitrogen rate. Recent legislation in North Carolina has mandated more intensive management of animal waste management systems. These systems must operate without discharging pollutants into surface waters. Furthermore, these systems must operate under a plan that specifies what crops are to be grown, appropriate waste application rates for those crops, and contingency plans or maintenance agreements for storing waste or transporting it to other farms. Commercial litter haulers (contractors) remove litter from poultry confinement houses or litter storage areas and then apply it to land on the farm or at another location. As a result, commercial litter haulers, regardless of the material’s ultimate destination, need to be aware of the new state regulations so haulers can work with poultry producers to assure that litter is handled properly and applied according to the farm’s nutrient management plan. 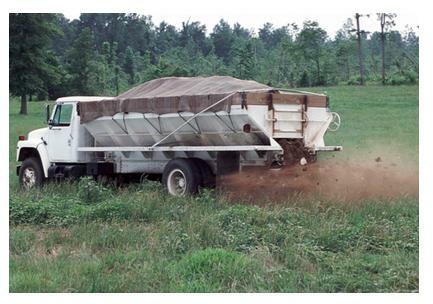 The North Carolina Department of Environment and Natural Resources (NCDENR), Division of Water Infrastructure (DWI), enforces rules specifically for manure haulers that became effective on September 1, 2006, and are contained in the North Carolina Administrative Code Title 15A NCAC 2T. 1400. Manure haulers are defined as “any person who accepts or purchases animal waste and land applies the animal waste on land not covered by the generator’s permit.” The rules cover all manure haulers regardless of how much or how little manure they land apply. If there are problems with the manure hauler’s operation, DWI may initiate an enforcement action. Part of the action may require the manure hauler to apply for a permit to operate as such. do not apply the waste closer than 25 feet from perennial streams or perennial waterbodies. register with DWI by no later than September 1, 2007. Mandatory reporting is required of some manure haulers, effective September 1, 2006. The requirements are contained in North Carolina Administrative Code Title 15A NCAC 2T. 1400 and affect haulers differently depending on the amount of manure transported. Manure haulers that land apply 100 tons or less of animal waste per calendar year are not required to submit an annual report. Those that land apply more than 100 tons of animal waste per calendar year must submit an annual report to DWI by March 1 of each year. Manure hauler application and reporting forms can be found at NCDENR Animal Feeding Operations: Application Forms and NCDENR Animal Feeding Operations: Record Keeping and Reporting Forms (NCDENR-DWI, 2015). date, location, amount, and acreage of all animal waste that is land applied. date, location, application rate, acreage, waste analysis, and receiving crop of all animal waste that is land applied. Commercial composting centers or other treatment facilities need permits from the NCDENR DWI. The permits for these facilities should list the materials that may be treated or handled. Manure haulers transporting litter to such facilities should be familiar with the requirements in the permit to determine whether animal wastes are acceptable. The litter hauler as well as the permittee (the composting center or other treatment facility) could be liable for results of litter disposal at a facility if it is not specifically allowed in the permit. With very few exceptions, the ultimate disposal site should be land (such as crops, pastures, or forest). Land application of animal wastes must be performed in accordance with an animal waste management plan. Such a plan was required to be implemented by January 1, 2000, on all farms that raise at least 30,000 birds and use dry litter waste management systems. Provide for periodic testing of the waste applied to cropland as close to the time of application as practical, but at least within 60 days of application. Provide for annual testing of the soil from fields where waste products have been applied. Consider the balance between nitrogen application rates and nitrogen crop requirements. Assure that soil pH is maintained in a range appropriate for crop production. Maintaining soil pH at an appropriate level can be accomplished by following the lime recommendations found on a North Carolina Department of Agriculture & Consumer Services Agronomic Division soil test report. Assure completion and maintenance of records (for a 3-year period) to document the date and rate of litter applications to crops. These plans must be kept on file at the farm. The plans are not required to be signed by a technical specialist certified by the North Carolina Soil and Water Conservation Commission. The plan may be written by the poultry producer or anyone else that understands how to develop the waste plan. It is useful to include an aerial photographic map in the waste management plan of all fields receiving litter, showing field identification and field size. The plan (and accompanying field maps) will inform the person applying litter of the correct rate of application (usually tons per acre) for each crop to be grown in each field. A waste management plan can be modified to add fields or to change cropping patterns as necessary. Failure to follow the waste management plan can subject the farm owner and/or operator to fines or other enforcement action. If a poultry producer contracts with a hauler to apply litter, the litter still must be applied according to the specifications in the waste management plan. The poultry grower is always responsible for records showing the amount of litter removed from his or her production facility. Depending on the agreement among the involved parties, the field-records portion of the waste management plan may be the responsibility of the poultry producer, the manure hauler, or other consultant. All fields that receive litter must be included in the waste management plan. The ultimate responsibility of proper litter application rests with the individual whose name is on the waste management plan (typically the poultry producer). Therefore, the poultry producer may require a contract or agreement from a commercial litter hauler that stipulates the litter will be properly applied. Poultry litter may not be stockpiled nearer than 100 feet to surface waters (such as streams, lakes, ponds, and swamps) or wells. There should not be any potential for spills or runoff into surface waters when applying litter. Therefore, some field buffers between litter application areas and streams or other surface waters are also advised. Reasonable buffer distances can vary greatly depending on soil type, slope of the land, and crop system, but buffers of 25 to 50 feet are commonly used. A commercial poultry litter hauler should also receive a copy of the most recent waste analysis that a producer has for the litter. This information will assist in calibrating equipment so that the litter can be applied at the proper rate to meet the crop’s nitrogen needs. Waste analyses are required within 60 days before land application of the waste; however, accepted average waste data may be used to calculate litter application rates. Specific buffer and waste sampling criteria may be required in watersheds that have nutrient-sensitive waters. Check with a regional office of the DWI for current standards on specific watersheds. Record-keeping is required of all litter applications when litter source is a farm producing more than 30,000 birds. The DWI recommends the use of division-approved forms for dry litter application. The forms are a convenient way to document proper litter application rates that are specified in the waste management plan. 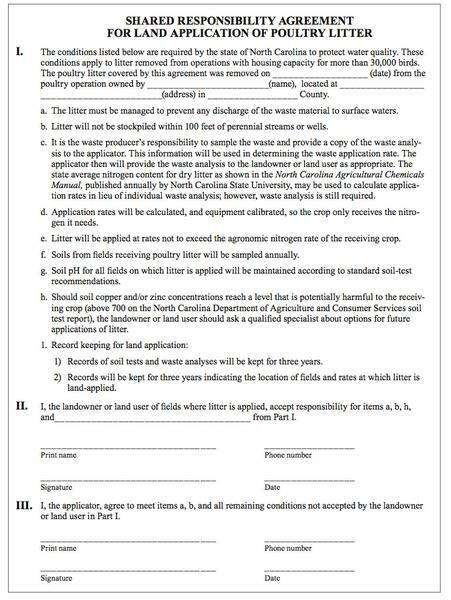 Record-keeping forms can be obtained from the poultry producer, as well as local offices of the North Carolina Cooperative Extension Service, nutrient management specialists such as the Natural Resource Conservation Service or Soil and Water Conservation District technicians, or private consultants. The poultry producer should record each cleanout and document the quantity of litter removed. If a poultry producer hires a manure hauler to remove litter and apply it to the land, the producer must keep records of the hauler’s name, address, and phone number. Requirements such as soil sampling, waste sampling, and record-keeping can be handled by any party (poultry producer, manure hauler, or other consultant) involved in the cleanout process. If the litter is removed from the producer’s farm, some type of formal agreement may be required between the poultry producer (litter generator) and the manure hauler that performs the cleanout and land application. As described in above, manure haulers may be required to meet specific reporting criteria. At a minimum, manure haulers should maintain for their own records a list of fields where litter was applied, the application rate of the litter, and the date of the application. A poultry producer may also wish to maintain copies of all records that are kept by a manure hauler, even if the hauler maintains separate records. Even with properly executed agreements, it is the responsibility of the manure haulers or individuals applying the litter to distribute the litter at the specified rates in the nutrient plan to the best of their ability. A sample agreement form is included with this publication. It was written to assist growers as well as other parties in dealing with the question of who has liability for the various stages of litter handling. This is of particular concern when poultry litter is removed from the farm where it is generated and the producer has no control over how it is applied to land. The agreement forms should address all land application requirements that are specified in the waste management plan. These include record-keeping, waste sampling, soil sampling, application rates, and buffers. The forms can be used to share the responsibility of the litter’s proper use by assigning particular responsibilities to specific parties. This agreement form is an example only. It can be used for general guidance and may be modified to fit particular needs. This form is not intended to serve as legal advice. Producers are advised to contact an attorney for specific information about contracts or other legal documents. Spreader equipment must be calibrated periodically to assure that litter is being applied properly and at the rates specified in the waste management plan. Guessing with application rates may result in either under- or over-fertilization of the crops. Proper application results in better crop management and minimizes potential regulatory or environmental problems with over-application of litter. Figure 2. Sample third-party applicator agreement. Poultry producers and commercial poultry litter haulers should operate under the waste management plan developed for the farm where the litter was produced, Furthermore, they should operate in accordance with an agreement or contract that clearly states responsibility for each component of the waste management plan. Properly applying poultry litter allows benefits to be gained from the litter, avoids water quality problems and nuisances, and keeps the producer and applicator in compliance with state laws. Barker, J.C., Evans, R.O., and Crouse, D.A. (1997a). Field Calibration Procedures for Semi-Solid Animal Waste Application Equipment – Load Area Method Spreader System (AG-553-5). Raleigh: NC Cooperative Extension Service, NC State University. Barker, J.C., Evans, R.O., and Crouse, D.A. (1997b). Field Calibration Procedures for Solid and Semi-Solid Animal Waste Application Equipment – Weight Area Method Spreader System (AG-553-4). Raleigh: NC Cooperative Extension Service, NC State University. Crouse, D.A. (2010). Realistic Yield Expectations for North Carolina Soils. Raleigh, NC: Department of Soil Science, NC State University. NCDENR—DWI. (2015). NCDENR Animal Feeding Operations: Application Forms. Raleigh: NC Department of Environment and Natural Resources, Division of Water Infrastructure. NCDENR—DWI. (2015). NCDENR Animal Feeding Operations: Record Keeping and Reporting Forms. Raleigh: NC Department of Environment and Natural Resources, Division of Water Infrastructure. This publication is a revision of an earlier version. The author would like to thank K. Shaffer for his earlier contributions.